How can I reuse or recycle vinyl banners? | How can I recycle this? How can I reuse or recycle vinyl banners? After last week’s post about BannerBags, I’ve been seeing that type of vinyl banners everywhere, particularly adorning the roadside along the main road towards the motorway. I remember thinking about those banners a few years ago at a geek conference thing but dismissing it as a suggestion for here because I didn’t think they were common enough (although since when has that really stopped me) and because, in the case of that conference, I could imagine people wanting to take them home as keepsakes. But, as I said, now they’re everywhere and not about keepsake worthy things. The ones that annoy me most are event specific things which sit on the side of roundabouts,forgotten about, until the rope holding them up rots or the wind blows them away. Sigh. 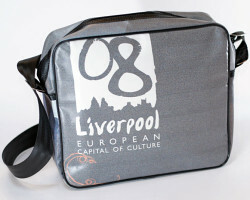 Anyway, we’ve got bags already on the list – what else could be done with them? Could be donated to a school to use as a tarp for arts and crafts. Could be used as any kind of tarp – to cover everything from floor to roof. Sewn, double thick, make into bags for laundry, trash, etc. Sew into a large square or circle, fill with layers of newspaper, for a weatherproof outdoor cushion/ground seat. Cut into strips, no more than 2 inches wide, weave into placemats, back with sold piece. Stylish for outdoor use. Take 2, put printed sides together, paint on new messge. I went to an outdoor butcher’s souk in Morocco a few weeks ago, they used old banners as table covers, not fancy but they can be wiped off. You can make messenger bags from them. We recycle PVC banner by shredding it and then granulating it so that it can be extruded into horticultural products such as tree protectors, tree belt fasteners and many other products – all in the UK. Sadly, there is a minimum quantity of two tonnes – but if Councils got together to collect it and delivered to our factory in Tenbury Wells we will recycle it for only a little more money than it costs to landfill it. I’m interested in reprocessing these banners. Do the banners you use have a nylon mesh in them or are they only PVC? Also, have you explored the possibility of using compression molding with several banners to make a sheet? I am going to recover flex banner polymers. Can you help me? what should I do for recover them? Hello Mike, it would be very helpfull to fiind a company like yours near by us – i.e. in west yorkshire, any ideas? or at least what to look for? I could have thousands of square metres of reinforced banner materials. The only alternative I know of for recycling is in Italy. Mike, I know this is an old thread but if you still receive alerts, I am very interested to receive more info on this process – thanks! We are looking to By Banner shredding Machine to make the used Banners to Granule. Please lead us how to find. G A Recycling have been asked this question quite a few times….we have now found an outlet for pvc banners. We collect banners from all over the UK in baled format. It is then sorted and possibly rebaled, and recycled in India. They are using it for umberella’s and roofing. If you would like to contact us please email or see our web site for contact numbers. i would like to know if you still recycle Vinyl Banners to Umbrellas. I am a student of the University of Ibadan, Nigeria and i am working on a project on How to save the world of wastes like Used- Vinyl Banners. Please, if you would be kind, contact me as soon as possible. This is urgent. My sustainability plan is depending on it. I strongly believe this can work out. Hello, did you get something on that project? i am working at something related, we could share some information. If you are nifty with a sewing machine and want to make some extra money, you can sew them into tote bags, bean bags and aprons and sell them at the markets. I work for a promo company so I offer this service to my clients. hi does anyone know where i can get used vinyl banners that have been discarded for free? i need it for a project i am doing and finding it hard to find any for free! thanks! How much vinyl banner do you need? Please reply to my email address. Have just read your posting (August) regarding vinyl banners. If you had a source of used banners they would be extremely useful for temporary waterproof roofing. If so would be great to here from you. Vinyl banners are just too sweet to pass by. Imagine getting your banner this year, and because it’s on high quality vinyl with heavy-duty grommets for hanging, you’ll still be using it years from now. 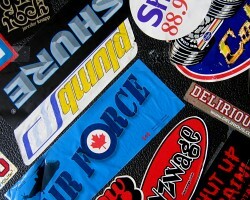 You’d be crazy to get your banner printed on anything but vinyl! I have used a banner I had printed with my designs on to make bunting with an old vinyl apron and plastic from bouncy castles! hello does anyone know where i can get used large vinyl banners that have been discarded for free? i need it for a project i am doing in africa and it is hard to find any for free! thanks! Why anyone gets thin printed vinyl banners nowadays in the UK surprises me. We use heavy duty vinyl (less likely to shred/damage) and either print a background and add lettering with vinyl lettering, or just use vinyl lettering. This way they can be re-designed for future events. We have some that have been going for 8 years, with four new designs each year. Sure, we have to occasionally repair or replace fixings, but at least the big lump of pvc vinyl is kept out of landfill. Hopefully more and more companies/charities/events will think of doing this as it works out cheaper in the long run and so good for the environment. please am from Nigeria, Africa. i have access to huge tons of used vinyl banner. i need where i could trade them out. Hi Nify, I hope you still have access to huge tons of used vinyl banners. We can recycle them into Products. We won an Award for our creativity. We can commercialize this, if we work and partner together. Am looking forward to getting a feedback from you. I am 15 years old and a Grade 10 IB student living in Surrey. As part of our Gr. 10 syllabus all Students doing the IB have to present a personal project. My personal project is about Recycling of plastic through innovative ideas and concepts. My project is made from 100% of recycled plastic. I was hoping you could help me aquire used, printed vinyl banners. I would only require a few banners as it’s a small personal project. I am happy to explain more in detail about my school and IB personal project and what it entails. Please contact me if you are able to help with any advice.